For alternative accommodations to pricey Disney World hotels, consider the WorldMark, with popular theme parks Aquatica and the Faldo Golf Institute closeby. Just a few minutes away from all parks. The Doubletree by Hilton Orlando at SeaWorld. Conveniently located adjacent to SeaWorld and its water park Aquatica and just minutes away from Universal Orlando Resort, Walt Disney World and the Orange County Convention Center. Add a trip to the laid-back Florida Keys to your Orlando vacation package for a Florida vacation to remember. Take a road trip to Tampa & St. Petersburg for fun in the sun after your Orlando vacation. Add a Panama City beach stop to you next Orlando vacation package for some fun in the sun. 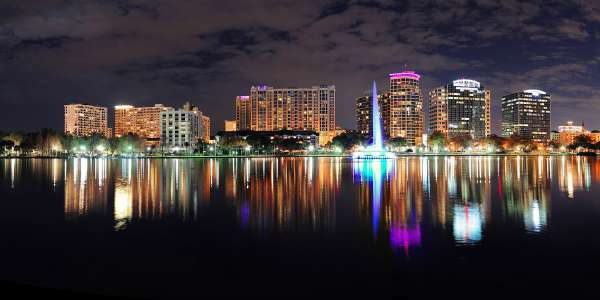 Located in central Florida, Orlando is the state’s fourth largest city and the Theme Park Capital of the World. With one of our Orlando vacation packages, you can enjoy tourist attractions as one of the city’s 62 million annual visitors. If you’re intent on experiencing one of the best Disney vacations, check out the enchanting fantasy world at Magic Kingdom, the cultural fun of Epcot, the exotic thrill of Animal Kingdom, and the movie magic inside Disney’s Hollywood Studios. Each of these four parks has exciting and captivating rides, shows, and adventures that will make you feel like you are in the middle of your favorite Disney movie. For some water fun, Typhoon Lagoon and Blizzard Beach offer giant waterslides and swimming pools. For a day away from theme park action, try shopping and dining at Disney Springs. Outside Disney, Universal Studios is another great option for family vacation packages. Enjoy your day exploring Universal Studios Florida and Islands of Adventure, home to the famous Harry Potter World, Jurassic Park, and Hollywood attractions. On your way in, you can enjoy the Universal CityWalk Orlando, which hosts various entertainment, shopping, and dining options such as the Hard Rock Café, Jimmy Buffet’s Margaritaville, and Emeril’s Restaurant Orlando. Outside the theme parks, Orlando boasts a thriving downtown complete with modern architecture, fine dining, and plenty of nightlife. Practice your golf swing at the Bay Hill Club and Lodge, catch a show at the Orlando Shakespeare Theater, or do some shopping at The Florida Mall. Search and book Orlando vacation packages or hotels to find luxurious accommodations right near your favorite parks or activities; or find budget friendly trip ideas so you can bring the whole family.